After setting off from La Gomera in the Canary Islands on December 12th 2018 Team Tyne Innovation have finished the Talisker Whisky Atlantic Challenge (TWAC), “The World’s Toughest Row” in record time, landing in Antigua just before 10pm on January 23rd 2019 after completing the 3000 mile crossing of the Atlantic Ocean in 42 days 10 hours and 26 minutes, a new record time for a mixed four. 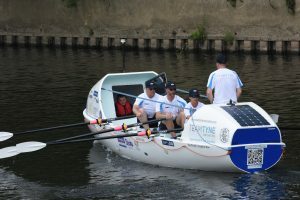 One of 28 teams entered in the race the crew of Steve Sidaway, Claire Hughes, Alan Huntly and Phil Kite rowed continuously in shifts of 2 hours on followed by 2 hours rest throughout the crossing, breaking the previous record by no less than 14 days. Since appearing with their boat at Durham Regatta last year two of the original crew members from Tyne Amateur Rowing Club, Dave Higgins and Guy Clack, were forced to withdraw, but their replacements Steve Sidaway and Alan Huntly rose admirably to the challenge. “Amazing” replied Claire Hughes in response to being asked how it felt being the first woman home in this year’s race. You can watch the team’s arrival in Antigua on the Atlantic Campaigns facebook page. In accepting the challenge the team was aiming to promote North East innovation, looking to market the best innovation from our Universities and businesses and to showcase them to the world. They were supported in their bid by several sponsors. The team is raising funds for 3 local charities – Daft as a Brush Cancer Patient Care, the Stroke Association and St. Oswald’s Hospice. Warmest congratulations to the team on their achievement. Featured image by Ben Duffy/Atlantic Campaigns.